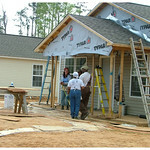 The average U.S. Habitat for Humanity home costs about $60,000 to build. It is then sold, with no down payment (other than hours paid in sweat equity) and basically at cost, to a family who would typically not be able to afford a home otherwise. The only way this can be done is through free – volunteer – labor. Here’s a very rough estimate on costs. 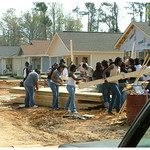 Let’s say there were at least 40 volunteers on our work site in Hattiesburg. Most of us worked 8 hours per day. If we were getting paid an unskilled labor rate of $6.25, Habitat for Humanity would have had to shell out $2000 for that week (assuming no benefits or overtime). 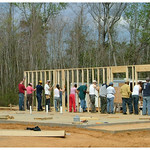 If a house takes 5 weeks to build, unskilled labor alone would add $10,000 to the cost of the house. This doesn’t include skilled labor such as electricians, plumbers, etc (which Habitat often does pay for). Of course, in the case of volunteer labor, sometimes you get what you pay for. While Dave and I aren’t professional contractors by any means, the amount of building we’ve done over the past 15 years (both through Habitat and in the theatre) made us some of the more experienced members of the team this week. Let’s take a look at some of our teammates! By far the best volunteer labor are students. Actually, this is a qualified statement: the students who come willingly are the best volunteers. They have youthful energy and are willing to do just about any job, from menial to quite skilled, as long as you show them how to do it. Our favorite people to work with this week included the students from University of Maryland Law School and Earlham College. It was particularly fun empowering the young women to use power tools. Evaluating church folk as volunteers is tough. It was hard for us to tell if some of the folks in the Baptist group knew why they were there. Some of them worked very hard and were pleasant to interact with. Others seemed very unhappy the entire time, gravitating to the edge of the scene, focused on their Bluetooth or Blackberry or digital camera. 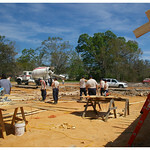 When they spent Friday morning doing a prayer service around the site, their presence made a lot more sense – but it may have been a better use of everyone’s time if they had gone around the Gulf Coast blessing construction sites, rather than hanging around our work site working hard at avoiding work. On the other hand, I’ve worked with church teams doing very hard work (here I’ll give a shout-out to my Cordova Neighborhood teammates with whom I dug baňo pits in Mexicali). It all goes back to the Theology of the Hammer (see “On Religion“) and people knowing why they’re there in the first place. Ultimately, we’re most biased toward people like ourselves – random people unattached to groups who made it a point to spend a chunk of time devoted to service to others. A round of applause goes to our friends from Seattle: Sue, Ellen, and Will. We couldn’t have made it through the week without you, your amazing attitudes, and your hard work.